adidas Energy Mode | Time to get charged up for the World Cup! When the World Cup kicks-off, it always brings a lot of attention from all kind of places from the World. The most watched sports event becomes the center of attention for a month. This attention gives a lot of energy which the players uses to go the extra mile and to create the decisive plays, that will win them the World Cup! The new adidas Energy Mode is the World Cup pack from adidas and the colours are all about the energy that’s created in the World Cup. The football boots of the pack are all made in colourful and strong colours representing the energy. 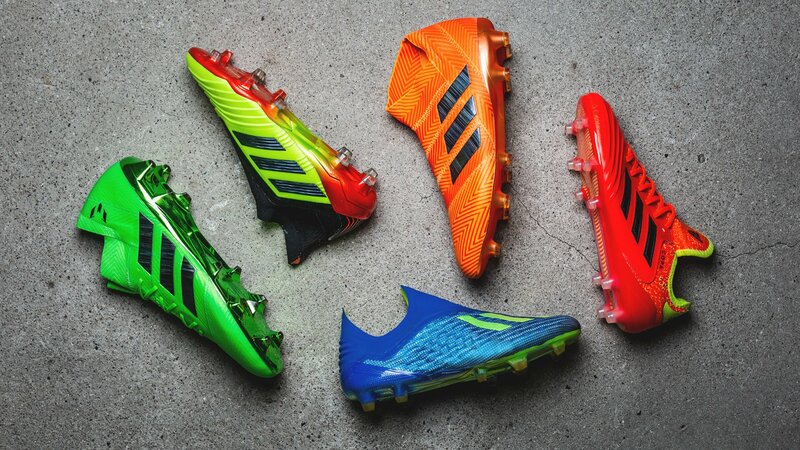 Each boot has got its own unique Energy colour, while we get a new laceless X 18+ and an updated Nemeziz 18+. Let’s run quickly through the most important stuff on the new blue adidas X 18+. The most significant change on the new X is that it’s become laceless, as the very first X boot ever! The primary focus for adidas was to use their Drillium philosophy, which is all about cutting down on the unnecessary materials without compromising with the performance of the boot. This boot is all about making the fastest players in the game even faster, by letting then unleash their speed in a whole new way. Want to go more in depth with the new X 18+ boot then read more about the tech right here! But, the new X 18+ isn’t the only new boot from adidas. The Nemeziz has also been updated, so we get a whole new Nemeziz 18+. The focus is still on unlocking agility but doing this with a whole new midcut collar! The disruptive and asymmetric collar is all about giving the players maximum freedom and an optimal support. It’s all about refining the Nemeziz DNA by enhancing the lockdown experience through the new collar. You still get the 360 Agility Bandage technology, which is inspired by medical taping, and this gives you a maximum agility. While the Agility Weave forefoot, a 3D engineered thin, soft textile, gives an enhanced touch! Now you might start thinking ‘What about Messi, is he going to wear a midcut laceless boot?’. We’ve all been seeing Messi run around in his own Nemeziz 17.1 with laces, because he wasn’t that fond of the laceless concept. Therefore, adidas has made the decision to cut off the Nemeziz 18+ and stick with the 18.1 as the top model boot for the Messi silo. The difference between the boots the 18+ and 18.1 is the 360 Agility bandage which is going to be just an Agility Bandage, and you have a laced Agility Fit on the 18.1. The Predator 18+ and Copa 18.1 are still the same boots, just made with some pure electrifying colours. Can’t wait to see Alli, Pogba and Özil running around the Predators this summer in Russia competing for the World Cup Trophy. Get your Energy on with the Energy Mode. Pre-order your boots now on unisportstore.com!